BLOX Adjustable Camber Kit - Pann Auto Performance - San Diego largest aftermarket automotive performance parts - What do you drive? 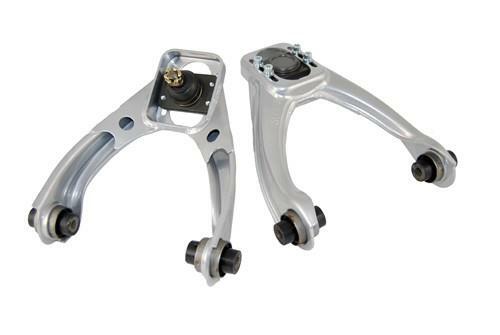 BLOX Racing’s standard adjustable camber kits are designed to replace the vehicle’s factory upper control arms. BLOX Racing adjustable front camber kits allow the user to adjust and fine tune the front suspension’s camber settings for optimum driving and cornering performance. By properly adjusting the front camber settings, premature and uneven tire wear can be reduced while greater tire contact patch can be created. BLOX Racing’s original front camber kit features its standard sliding ball joints, which allow for quick and easy adjustments. The Roll Center Adjusters are extended ball joints that are designed to directly replace the factory ball joint inside the front knuckles. When a vehicle is lowered, the geometry of the front suspension becomes altered. The lower the vehicle is, the greater the angles are increased. This change drastically affects camber and caster, steering response, stability, handling and cornering performance. The BLOX Racing Roll Center Adjusters, with its increased length, are able to reposition and correct the angles of the front knuckles and lower control arms. The resulting correction in the suspension’s geometry will improve response and handling and increase tire contact patch and tread life, while making alignments more consistent. BLOX Racing always recommends safe driving heights. Best results use with BLOX Racing adjustable front camber kits.